The kitchen sink holds the most important place in a kitchen just like the kitchen holds the most important place in a home. It is the most frequently used appliance in the kitchen even when compared to the oven or dishwasher. The kitchen sink is one of the most important decisions you will make while planning your new kitchen because it is the only appliance that is not portable and can’t be moved if you decide the placement is wrong. Your choice in kitchen sinks will affect your daily kitchen time for many years. As such there are some quite important features that need to be considered while selecting a sink. Let’s take a look at a few very important things to keep in mind. The sinks can be classified into different types depending upon the method of installation. The top-mount sink is the easiest to install as the sink is fixed into a hole in the counter. The disadvantage with this type is that the debris of food particles get caught up in the space between the basin and the countertop and you have to regularly clean it up with a brush. The second type, the under-mount sink is installed under the counter and are supported from beneath by the cabinet structure. They are easy to clean as you can clean your countertop perfectly by wiping out all the smallest food particles directly into the basin. There is another type of sink, the flush-mount sink, that is installed into the countertop and cut properly to make sure the top rim of the sink is in level with the worktop. It allows easy cleaning and seamless work surface. While deciding the number of basins in the sink, you have to keep in mind the advantages and disadvantages of the configurations, consider your daily activities and daily sink utilization. Single large basin kitchen sinks allow ease of washing of big pans and other large dishes. They offer plenty of space to stack dishes while you’re still busy working on other things. 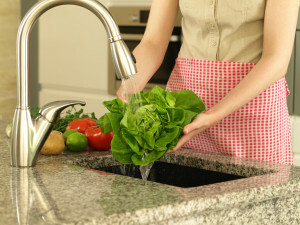 The downside is that you have to juggle with the vegetables while washing them and you may run into the issue of dishes being in the way of cleaning foods during food prep. The traditional two basin sink is very popular, but presents the disadvantage that you cannot wash large dishes easily in it. Sinks having two or three basins of different sizes allow you to prepare food easily in the smaller one while washing large dishes in the bigger basin. The size of the sink is determined by the size of the kitchen; large sinks for big kitchens while small sinks or single bowl sinks for small kitchens. If you are looking for a cost effective, usable and durable material, stainless steel is the best choice. It has a shiny and smooth look and can be cleaned easily just by wiping with a clean cloth. There are other options including ceramic, cast iron, fireclay, and other metals. Cast iron does not go well with under-mount sink because it is quite heavy and requires a strong base to be supported while fire-clay is durable and classy but an expensive option.